Save SAR 36 (92.31%) – Earn 0 Shukrans What is Shukran? Shukran is the Landmark Group’s award-winning loyalty programme in the Middle East, which allows you to earn Shukrans when you shop any of our brands. Allowing your kid to play in the sand will enhance her hand-eye coordination and this beach set helps her in the process. 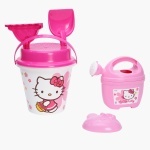 The Hello Kitty print makes this set look appealing while the good-quality material adds to its durability and safety.